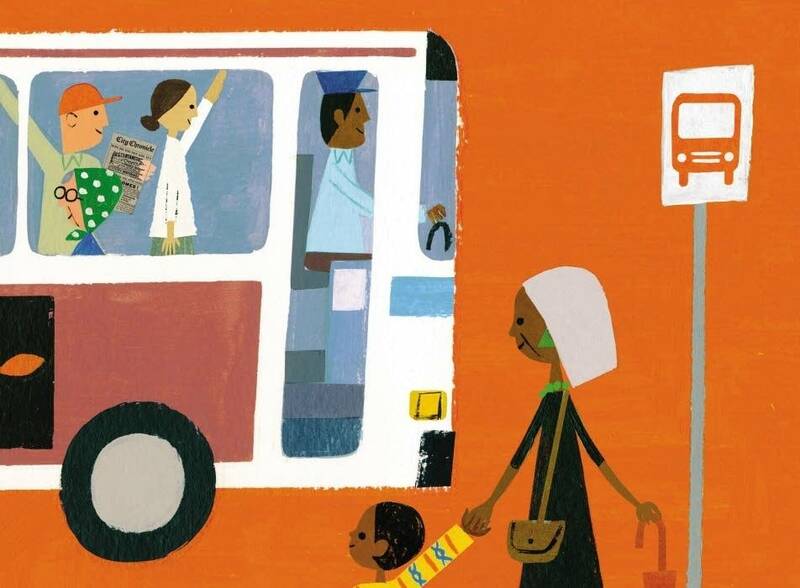 "Last Stop on Market Street" is a children's book phenomenon. The cover barely has enough space to display all of its awards: It has won the Caldecott Honor, the Newbery Medal and the Coretta Scott King Award. Writer Matt de la Pena and illustrator Christian Robinson joined MPR News host Kerri Miller to talk about the book's success — and the importance of diversity in children's lit. • Where are the diverse children's books? "I used to talk overtly about race and diversity in my novels," de la Pena said. "Over the years, I've decided that the new diversity I want to explore is writing about characters that are diverse, in stories that aren't overtly about race." "Last Stop on Market Street" follows a young boy named CJ and his grandmother as they ride the bus through the city on the way to a soup kitchen where they volunteer. The story resonated with Robinson, who was also raised by his grandmother and has fond memories of riding the bus with her and people-watching. On the bus, CJ watches as people hop on and off: an old woman with curlers, a man tuning his guitar, a blind man with a service dog. The bus ride and the soup kitchen illustrate slices of life not typically found in children's books, de la Pena said. "A lot of people label me as someone who writes about race, but I think the thing I'm most fascinated by is class. I like to describe it this way: My goal is to show the beauty and grace that exists 'on the wrong side of the tracks,'" he said. The book's illustrations are reminiscent of Ezra Jack Keats' classic, "A Snow Day." Robinson said that book was one of his biggest inspirations as an artist: "That book was a game-changer: It featured an African-American boy, but it wasn't overly about race." "A Snowy Day," which tells the story of a young boy exploring a snowed-in city, was viewed as revolutionary when it was published in 1963. It featured a young black boy, Peter, on the cover. More than 50 years later, the struggle for more diverse characters in children's books is still ongoing. And diversity doesn't just include race — it includes gender, sexual orientation, religion and more. Organizations like We Need Diverse Books, which de la Pena sits on the board of, work to raise awareness and encourage diversity both in books and in the publishing world. A recent study of major publishers, commissioned by Lee & Low Books, showed that the publishing industry as a whole — including sales, publicity, and executive departments — is 79 percent white, 78 percent women, 88 percent heterosexual, 92 percent non-disabled. This can be problematic, de la Pena said, because "everyone has blind spots" based on their experiences. But when an office is filled with people of diverse backgrounds, they can "cover each other's blind spots." Having a diverse group of people writing and publishing a diverse range of stories benefits everyone, de la Pena said. "I would love for these stories to be read by every family — including wealthy, suburban families," he said. "I think it's equally as important for those kids to be exposed to a soup kitchen, just as the kids who already understand what a soup kitchen is." For the full discussion with Matt de la Pena and Christian Robinson on "Last Stop on Market Street," use the audio player above.